The Clerk of the House has published an updated edition of this invaluable booklet that offers a short guide to the business of the House of Commons. 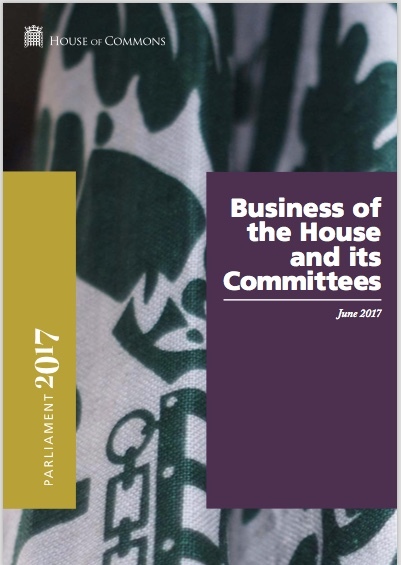 This guide is designed to help Members take part in the business of the House and its committees. There is usually no substitute for face-to-face discussions with the staff responsible for each day-to-day operation. So I would also encourage you to get in touch with the specific office as soon as you decide, or are required, to get involved in a new area of activity. You will be able to identify the office you need via the information in this guide or by visiting the Procedural Hub located next to the Debate cafeteria in the Portcullis House Atrium. And in the first instance, I would encourage you to make direct contact yourself.